Why Do Catholics Worship Statues? I am reminded of a story I once heard from a traveling priest. He mentioned touring the church he was to celebrate mass at the next day and he noticed a group of children praying to the statue of Mary. Upon further inspection, he realized that it was a collective statue of the Fatima children and Our Lady of Fatima. He couldn't resist commenting to the tour guide: "What a religion! Not only do we worship statues, but our statues worship statues!" Of course Catholics do not worship statues, but fellow Catholics will get a laugh out of this story. You shall not make for yourself a graven image or any likeness of anything that is in heaven above, or that is in the earth beneath, or that is in the water under the earth: you shall not bow down to them or serve them (Ex. 20:4-5). And you shall make two cherubim of gold of hammered work shall you make them, on the two ends of the mercy seat. Make one cherub on the one end, and one cherub on the other end; of one piece of the mercy seat shall you make the cherubim on its two ends. The cherubim shall spread out their wings above, overshadowing the mercy seat with their wings, their faces one to another; toward the mercy seat shall the faces of the cherubim be (Ex. 25:18-20). I don't know about your family, but I know that around my house, the walls are full of pictures depicting loved ones who are alive, or have left this world. Never in a million years would someone walk into my house and declare that I was worshiping those pictures. Yet they do the same for the images of Mary, Jesus, and the Saints that are also in my house. 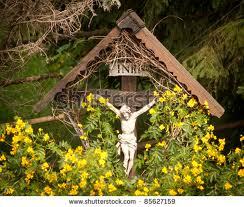 When one hangs a crucifix on the wall by no means does he believe "Oh my! This is the true Christ hanging on my wall!" No! He believes that this image of Christ crucified will remind him of the true Christ in Heaven - the crucifix serving as an aide in prayer. God did ban the worship of statues. But He did not ban the making of them, otherwise where would the great photos, statues by famous sculptors and paintings be? Christ revealed himself to us in a tangible form (His body here on earth in human form and His body now under the veil of bread and wine). Since these tangible forms were given, common sense leads us to the conclusion that we are able to use these images to bring ourselves closer to God. Thus, in an answer to the question "Do Catholics worship statues?" the answer is No. In fact, the Catholic Church condemns idolatry and similar practices. What those who question Catholic action fail to realize is the difference between seeing a statue as a god or seeing a statue as a visual reminder of the true presence in Heaven. Please let me know if you have any questions concerning this topic through commenting on the blog!